Sometimes you’re just not feeling well and you decide what will really make you feel better is to repaint your bedroom ceiling – hey, we’re all unique, yeh and the last two years has had some weird side effects. One weekend later, neck strain, paint blisters (yes this is a thing) and 50 squid worse off and ta dah!!! Back to now and I’d been perfectly happy with paint job no.3 for almost a year now. 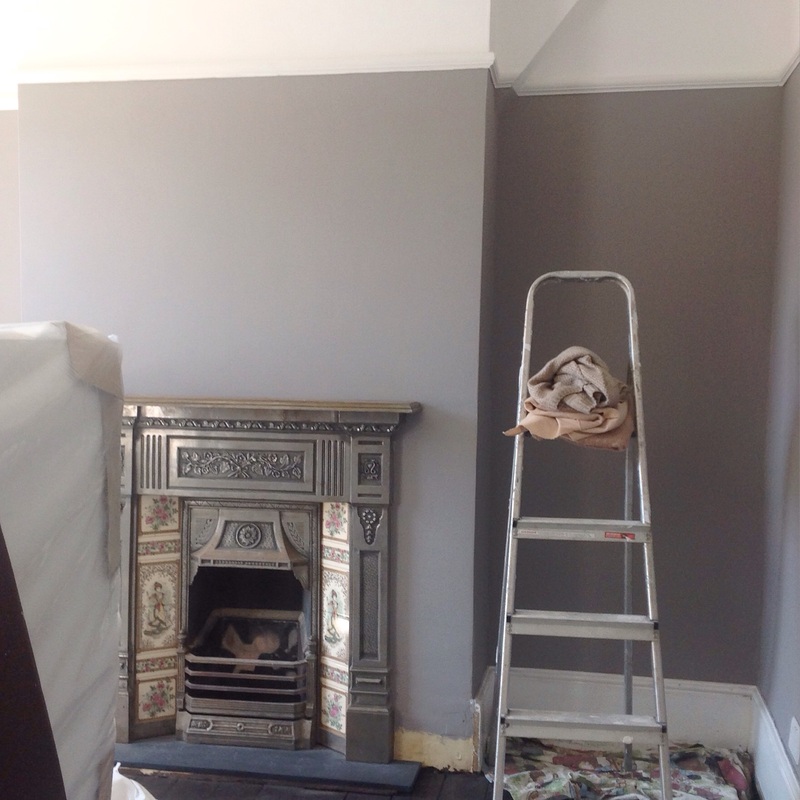 Relieved to have finally found ‘the colour’, ‘Dolphin’ from Little Greene is an amazing grey-not-grey, not-so-feminine that your other half protests immediately, not-so-mauve that your nan likes it kinda shade. 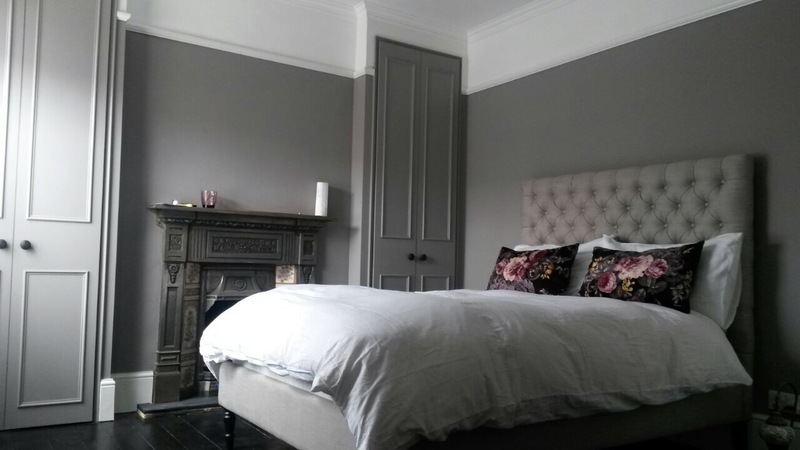 We used it on both the walls and our Ikea-hack alcove units (more about that later) whilst the woodwork, above the picture rail and ceiling were painted a traditional crisp white. Now that I think about it, there was never any discussion – I mean, what other colour would it be? Ceilings are traditionally painted white for a reason, it adds height creating the feeling of light and space and which of us isn’t trying to achieve that in our own little homes? I don’t think anyone ever decorated a room with the intention to create a dark and gloomy space. But then all these amazing Abigail Ahern-esque monotone pics started popping up on my favourite inspo hotspots and the boy could smell trouble coming. They weren’t oppressive and gloomy at all, in fact, fully washing a room in one colour, ceiling and all, creates the opposite effect. 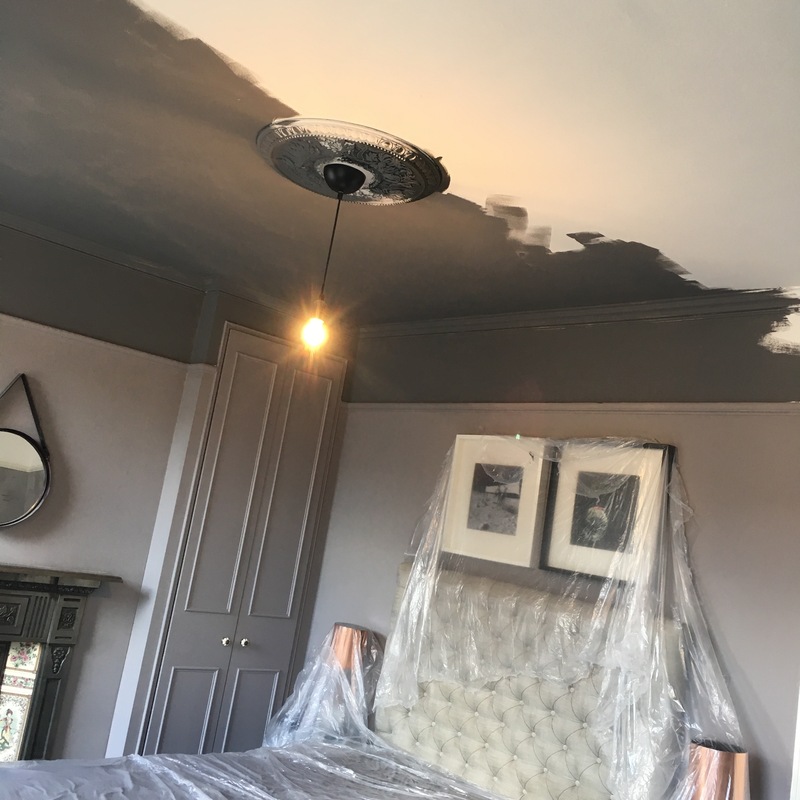 Suddenly the ceiling becomes part of the room again, enveloping you in your space and creating one big cozy, cocoon – just what I wanted our master bedroom to be. 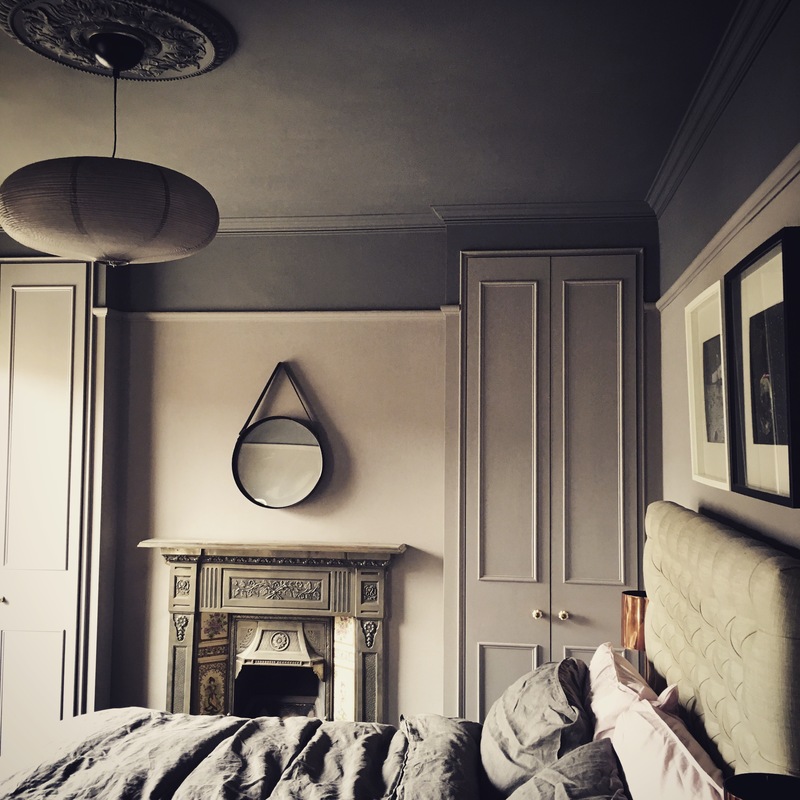 There was one thing stopping me reaching for the paint – whilst I am all heart shaped eyes for these inviting spaces, one of my only 3 demands when looking for a house was that it had to be a period property. The romantic in me is a sucker for anything cast iron, beaded or brass and if for no other reason than we went to the trouble of putting the picture rail back, I wasn’t keen to make it redundant now. This room’s painted ceiling is drawn way down, which its proportions have no problem dealing with. It’s become part of the room again and it looks like a dreamy night sky – perfect! What’s not working for me is the contrasting colours. I want a space that’s warm and cosy like a bear hug and this ceiling, as good looking as it is, is not the hugging type. The change in colour awakens the senses, like a peacock splaying its feathers, it demands attention and undeniably becomes the attention seeker of each of these rooms. It’s an interesting change in dynamic that’s got me thinking about my dining room (watch this space), but it’s not for this bedroom. So we’re agreed, we’re done with white, we are acknowledging the ‘other wall’, but we don’t want it to have run of the joint. We want it to work with our colour scheme, but we don’t want it to kill thelittlevics vibe. I set about looking for a shade that was different to the one we had, but within the same colour scale. Testers on and a consultation with the insta fam later and this happened. Now I know what you’re thinking – I just told you not to do that. True, but, there are a three reasons why this is an exception; 1. I had done my research as evidenced by the pre-ramble you’ve just read through, 2. I’ve used this grey before and know it well, 3. most importantly of all and in which case all other prior rules no longer apply – sometimes, you just know. The first 3 attempts I acted impulsively in a desperate attempt to make progress, now I was acting impulsively because I knew it was exactly what I’d been looking for. I promise, this isn’t me making excuses for myself – though the boy will tell you I have been known to do that. People have commented it’s a ‘bold statement’, but it’s actually turned out to be the exact opposite; if you turned up at a party and one friend walked in wearing monochrome stripes and another wearing shades of grey, who would you say was making the statement? 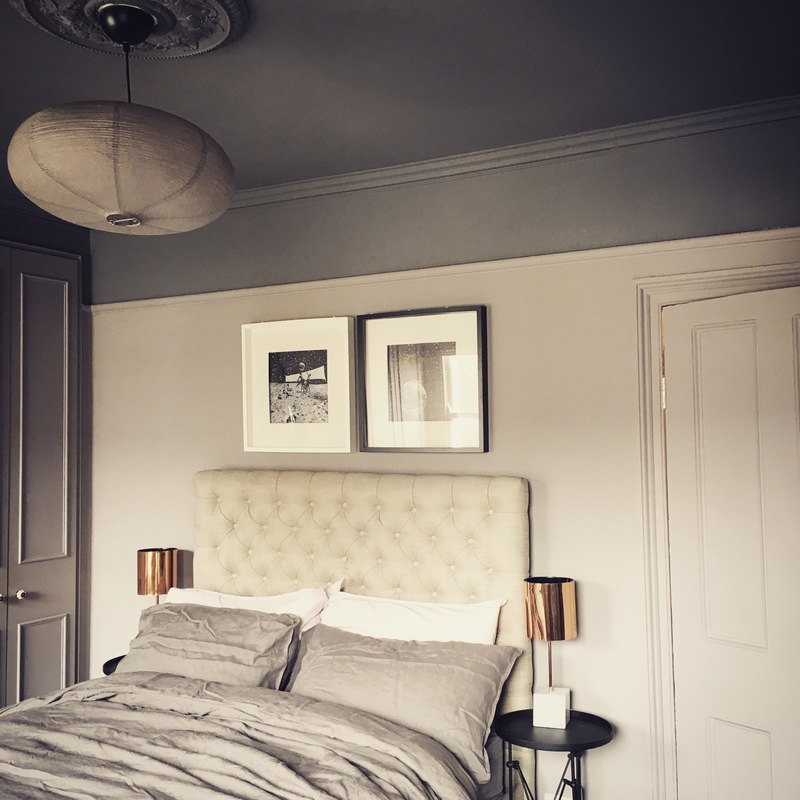 It’s not until all that white was wiped out that I realised it – dressed from ceiling to floor in an entirely muted palette, our bedroom became calm, chilled and incredibly cosy – exactly what this space needed to work for us. It’s not for everyone, I get that, but it’s worth considering painting / leaving your ceiling white as a conscious decision that could either help or detract from the space you’re trying to create. There are lots of different ways to make a painted ceiling work for you and even taking it one shade lighter or darker can have a transformative effect. So if you’re sat there tempted, thinking you could never do it, do some research, decide what would and wouldn’t work for you and then go ahead, ‘make a bold statement’. So what do you think? Love it or hate it? Got a painted ceiling? Lemme see @thelittlevic!